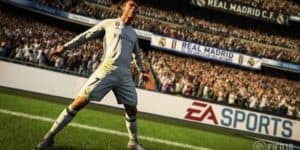 Nintendo Switch Will Get More FIFA Games | Nerd Much? FIFA 18 is "the best portable FIFA we've ever done." In an interview with GameSpot, supervising producer of the FIFA series Andrei Lazarescu addresses some of the concerns fans have had about FIFA 18. First, Lazarescu makes it clear that there will be more than just one FIFA game on the Switch. This is unlike what has happened in the past with the Wii U, where only one FIFA game appeared and then no others. But as EA has told us before, more EA games coming to the Switch rides on the success of FIFA 18. There are of course problems with this logic, as the gamers who play other EA games do not necessarily play FIFA as well. As such, it seems Lazarescu is quite confident that FIFA 18 will be successful enough to bring more FIFA games in the successive years. He even states that this game is “the best portable FIFA we’ve ever done.” High praise when the Switch version doesn’t include The Journey mode. This is because, according to Lazarescu, “The Journey is a mode powered by Frostbite” and since the Switch isn’t compatible with that engine, “it doesn’t have The Journey.” If the Switch ever becomes compatible with Frostbite, it is possible that The Journey will make it to future FIFA games. But thus far, that is a very unlikely possibility. That said, most fans of FIFA are in it for the multiplayer and co-op modes, not the single player campaign. Especially with co-op modes, the Switch is ideal for this. It should come as no surprise that EA chose to focus the Switch version on that and online features, than making a whole new single player mode for the console. EA is nothing if not focused on profit with the least amount of effort. At least the soccer fans will be thrilled, the rest of us still hoping for Battlefield 1 or Star Wars: Battlefront II to come to the Switch will have a long wait ahead. FIFA 18 releases on the Nintendo Switch, PS4, Xbox One, PS3, Xbox 360, and PC come September 29, 2017.